We promise to give you the best products with unparalleled service, every time, guaranteed. Flexfire LEDs is famous for creating unique interior and exterior lighting experiences by manufacturing and distributing our powerful linear LED strip lighting products. Trusted by the top design and construction firms world-wide, we are the leader in quality LED strip lighting solutions. We're just as crazy about quality components as we are our customer service. You may have noticed our beautiful indirect lighting accents in the Bellagio Villas, Embassy Suites, Hilton, and Marriott properties, experienced them inside major international airports and duty free locations, or heard about how we assist the engineers and scientists at JPL, Northrop Grumman, Boeing, Bigelow Aerospace, and the Hyperloop project with extremely bright low profile task lighting. If not, there is a good probability you walked into a trendy shopping mall, retail store or beautiful home and noticed the crisp and beautiful lighting provided by our strips. Our strips are UL listed with a 5 year warranty. Whatever the lighting challenge is, Flexfire LEDs is here to educate and provide a custom or out of the box solution. Don't just spec us, talk to us! We have a full design team in-house to answer any questions and turn your design ideas into realities. 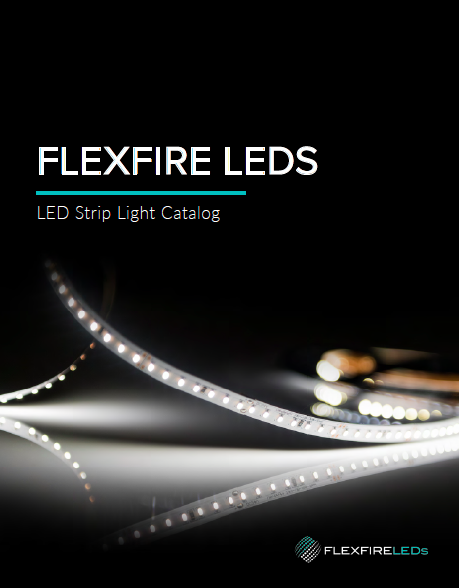 If you use Flexfire LEDs just once, you will never use another strip lighting company again. 1. We don't just sell, we educate. 2. We obsess over our clients, not our competitors. 3. We are as uncompromising about flawless lighting design as our mission. 4. We do not make recommendations we would not use ourselves. 5. We believe nothing is ever perfect, as it can always be improved. 6. We value curiosity and the exploration of ideas. 7. We speak the truth and deliver the raw facts. 8. We give ourselves the autonomy to be awesome. 9. We are unreasonably selective about quality components. 10. We believe in work/life balance, not work vs. life. 11. We believe in the personal growth of our employees, suppliers, customers, and community.